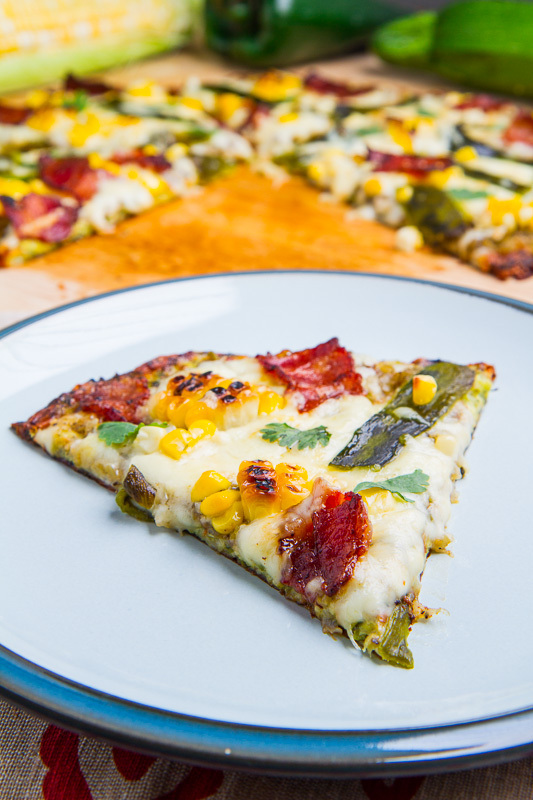 A healthy zucchini pizza crust topped with spicy salsa verde and roasted poblano peppers, sweet grilled corn, salty bacon and plenty of melted cheese! Who can tell what my favourite new recipe was this summer? You guessed it, the zucchini pizza crust, and I could not resist getting one more in while the zucchini was still around. 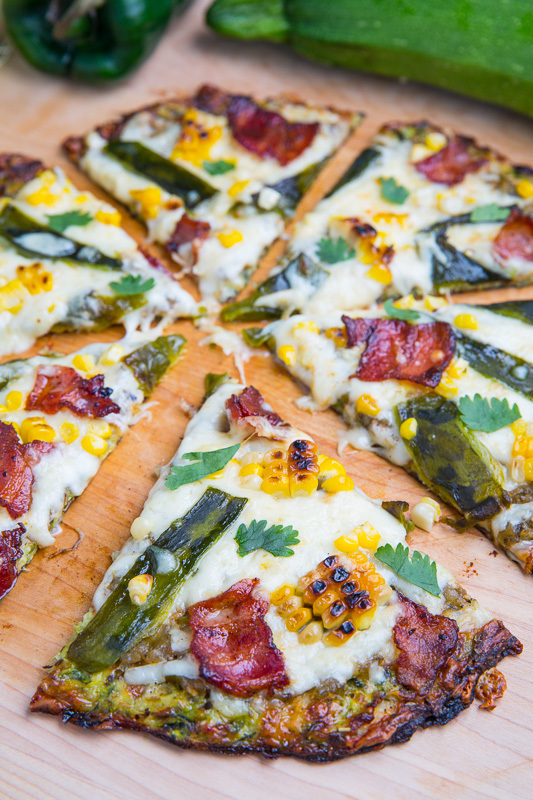 I have really been enjoying the zucchini and corn combo this year and I had one more idea for pizza using them, this time using a spicy salsa verde as the pizza ‘sauce’ along with some roasted poblano peppers and smoked bacon. 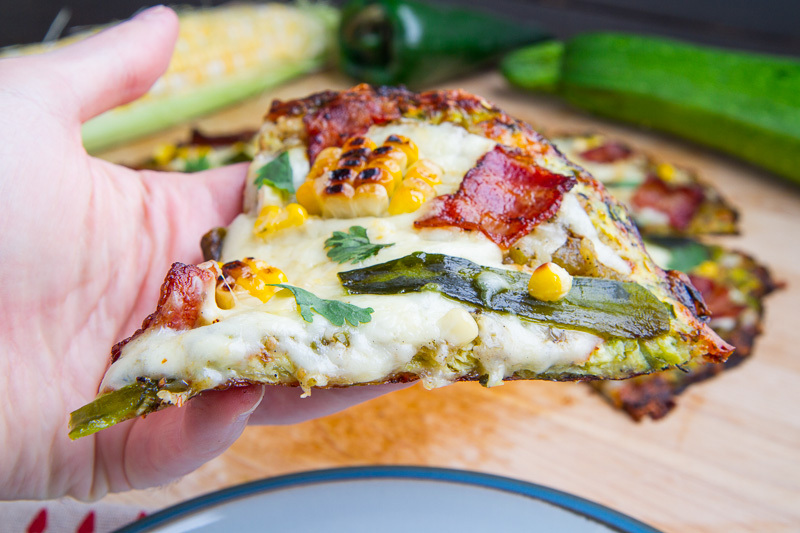 This grilled corn, roasted poblano and bacon zucchini crust pizza is so simple and yet so amazingly good! 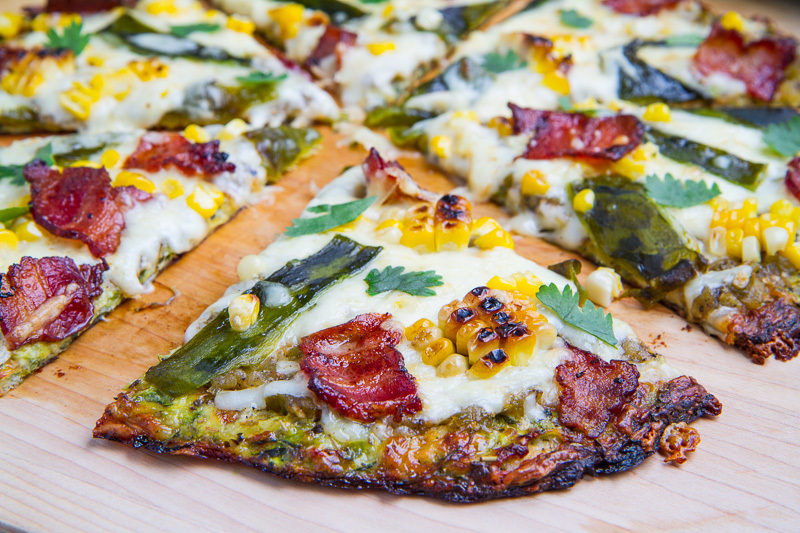 The sweet corn definitely pairs well with the spicy salsa verde and smoky roasted poblanos and bacon! The zucchini crust pizza can definitely be eaten by hand just like an ordinary pizza! 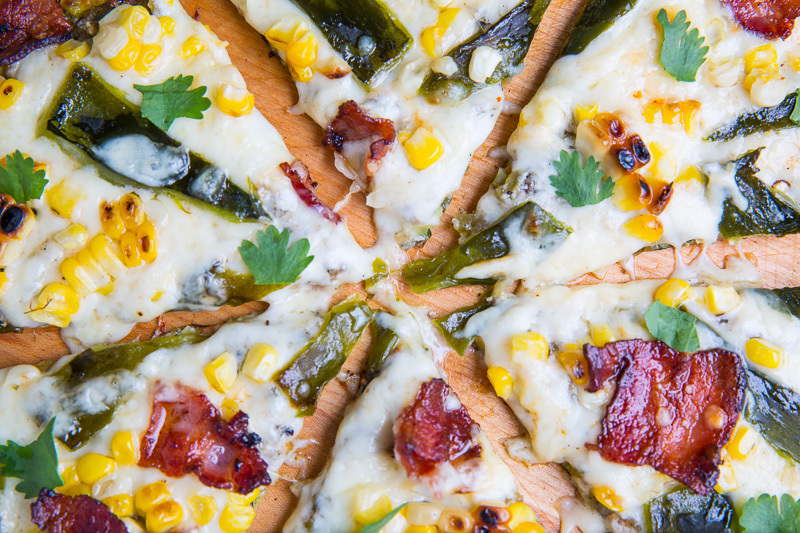 Spread the salsa verde on the pizza, top with the mozzarella, corn, poblano pepper and bacon and bake in a preheated 450F/230C oven until the cheese is bubbling, about 10-15 minutes. Optionally serve topped with fresh cilantro. Tip: If your salsa verde is really wet, simmer it a bit to remove some of the excess water. You come up with the best pizza combos! I love this one, Kevin and I still need to try the zucchini crust! Looks awesome! AWESOME! 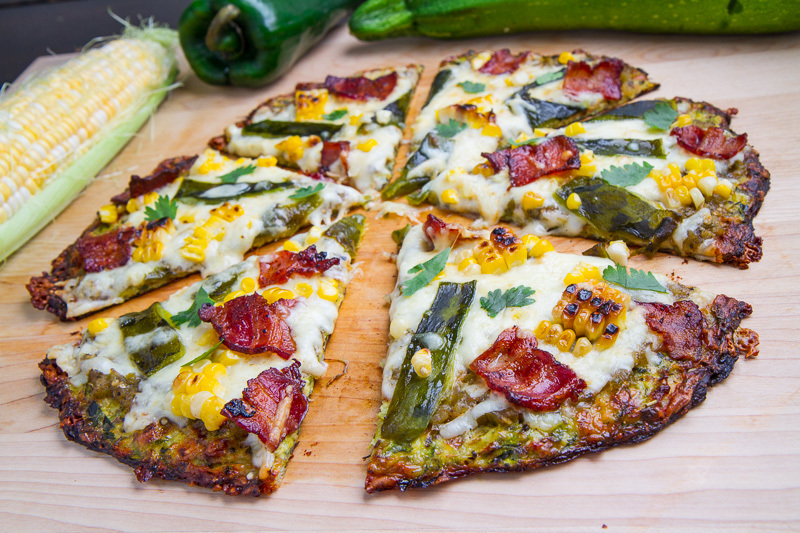 Here is an idea I never considered…zucchini pizza crust! I'm definitely going to be testing this out 🙂 It looks AMAZING! I hope it cools down so I can try this tonight….beautiful pics . I really enjoy your recipes……simple healthy food ingredients that come to life thru your delicious recipes. Nice work! Mahalo! where would you get the crust at? I love this. What a great idea! Wow! Zucchini crust?! Wow, never heard of that. Very creative. Judging by pictures, it does stay together nicely. Love the flavours combination. Wow! Love the idea of zucchini crust! Gorgeous pizza! Who can ever miss the gluten in pizza crust when you have this! Looks tasty and I love the colours! This pizza sounds DIVINE!! Love that crust!! Anonymous: Click through the link under the zucchini crust for the recipe.